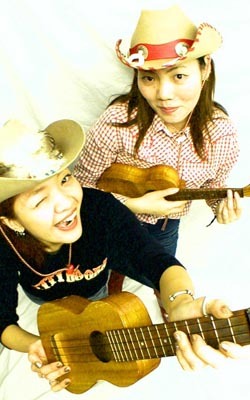 World famous ukulele-playing pop duo from Tokyo Petty Booka do Hawaiian and Bluegrass (including Reggae and ska)-inspired covers of country, punk and classic-rock -- everything from Patsy Cline to Ramones. Since they have released their debut album "Toconuts Hawaii" in 1995 , from BENTEN Label in Tokyo, they have been releasing the variety of albums of Hawaiian, Bluegrass, Country, Christmas and Dance Hall with the greatest Japanese musicians and some special guest players, like the legend of exotic sound , Martin Denny plays piano and MFQ:Modern Folk Quartet does the chorus of "Summer Breeze" . Although they hadn't had the record release in USA until 2001, a number of radio stations in the world have been playing their songs last 10 years and the buzz was already started. Their first US appearance was SXSW 2002 which was a big success and more than 200 copies of CDs were sold the night. Then they were futured by the radio program of BBS Global Hit broadcasted 500 stations all over the world. Petty Booka had "We love you, America tour" in 2002 and 2003. Their 1st debut Hawaiian compilation album in US "Let's Talk Dirty in Hawaiian" became No.1 on KUSF' world muisc chart and No.5 on the Top 30 the week of April 28 in 2003. Their Christmas album titled "Christmas Everywhere" was released from WEED and they did Ukulele Christmas US/eastcoast tour in December,2003. In March 2004 again Petty Booka went back to US with 4 other Japanese all girl bands for The Japan Girls Nite US tour (LA/SXSW/Chicago/Boston/NY/Seattle/SF). Petty Booka new album(Bluegrass!) is going to release in Japan soon.